Cape Cod is a famous vacation get away location. West Yarmouth is full of history and activity. This quaint home is a charming example of a New England shake shingled house with all of the modern conveniences. You will be less than 100 feet to the beach, with views of the Atlantic Ocean and Lewis Bay. Enjoy the activity in the bay with windsurfers, sailboat races and ferries traveling to Nantucket and Martha's Vineyard. Enter your home away from home into an open floor plan where a bank of glass sliders provide window to Lewis Bay and all its vibrant activities. From the living room with fireplace, vaulted ceiling and loft, dining room and kitchen area, you can excite all the senses – see, feel, hear, touch and smell the sea and salt air. Take it all in as you may discover that this is the real fountain of youth. This cozy, three-bedroom/two-bath home is a charming example of a New England shake-shingled house with all the modern conveniences. 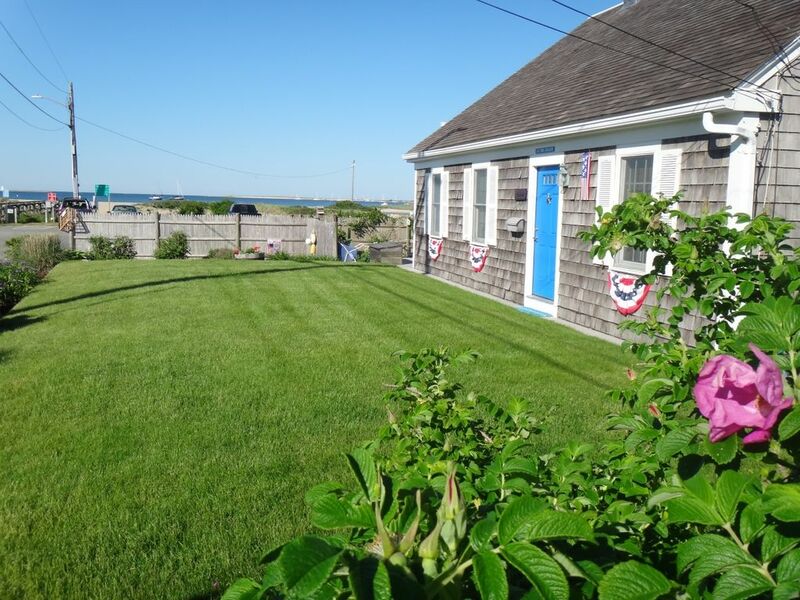 It's 100 feet from the beach, and offers views of the Atlantic Ocean and Lewis Bay. You'll enjoy watching the activity in the bay -- windsurfers, sailboat races, and ferries traveling to/from Nantucket and Martha's Vineyard. The home features an open floor plan, where a bank of glass sliders provides views of Lewis Bay and all its vibrant activities. There is a living room with a fireplace, vaulted ceiling with ceiling fans, and loft. There is a dining area and granite peninsula with seating for six in the kitchen along with laundry on the first floor. The kitchen is well equipped with refrigerator, microwave, dishwasher, stove with two ovens, coffee maker, K cup, and coffee grinder, wine cooler, blender, mixer, toaster oven, a spice collection, and a wide assortment of cooking utensils and gadgetry should you decide to eat in. The main living area includes a large HD TV with Blu Ray DVD player, and a video collection. There is also an MP3 player, stereo with radio, CD player and a CD collection. Upstairs has an open loft area with a wet bar. Games include puzzles, assorted card games, checkers, Uno, Sorry, Monopoly, Yahtzee and others. The first bedroom with queen bed has it's own fireplace and views of Lewis Bay with flat screen TV, DVD player, and sliders that open for fresh salt air and summer breeze that you will remember long after you return home. The second bedroom downstairs has a king size bed with flat screen TV, and DVD player. The master bedroom upstairs has a king size Sleep Number bed, and view of the ocean to round out the sleeping arrangements you'll find in our home. This bedroom also has a flat screen TV, DVD player and XBox, with games included. All bedrooms have alarms, radios, and bed side lights and stand alone fans. An expansive ocean side deck and almost entirely enclosed yard allow for summertime family fun cooking out and playing games on the lawn. Sand chairs for the beach are provided. You'll excite all your senses with the beautiful views and the great sea and salt air. As you take it all in, you may discover that this is the real fountain of youth! Enjoy relaxing on the deck while sipping a glass of wine with your New England clam chowder, as the day winds down and the winds pick up. Take in all the mystical New England landscape! And in the evening, why not prepare that perfect seafood meal in our fully-equipped kitchen -- complete with lobster and clam pots! Meticulous attention to decorating details gives this home a wonderful combination of historic Cape Cod charm and modern comfort. You'll feel like your own home has moved surf side! Note: Owner lives in separate building on site which has privacy fence and entrance door away from main house. As we are 6 miles from the airport, we occasionally hear airplanes flying overhead. My wife and I are currently retired after 32 years living in the US and Asia working for a large corporation. We had several oceanfront rental properties over the years from cape cod to st. thomas, virgin islands, but now only rent our home in cape cod, the origin and flagship location of our rental business. We grew up in New England and Cape Cod has always held a special place in our hearts. Immediately fell in love with the views and coziness of this home the moment we first walked in the front door. We have made several capital improvements to the house over the years, but hopefully kept the same original beach charm. West Yarmouth was perfect for us as it is so centrally located for activities, restaurants and shopping. In addition, it is a short drive once over the bridge. bath and beach towels provided in addition to bed linens. (2) One in living room, one in Master Bedroom. Includes chilled and filtered water, and ice maker. Also have wine refrigerator with dual temperature controls. spices, oil, vinegar as well as paper products and soaps, detergents to get you started. separate dining table as well as peninsula in kitchen area for 6. The property was lovely with great views and kept very well! The owners left instructions for just about any question you might have which made it very easy. They have just about anything in the house you will need from shampoo to Laundry detergent to board games. Brian and Gail are a class act and are available and responsive to any questions/issues you might have. Thank you for a fantastic week and for making our first VRBO experience a great one! Loved our week here. Owners great to work with and had many welcoming touches for our stay. Home is extremely well equiped and had everything we needed. The weather was pretty humid and things cooled off in the evenings with great breezes most nights. Felt like home the moment we walked in. View of the Ocean from the upper deck is something to be enjoyed over coffee or wine. Central location made it very convenient to find something to do with the kids. Thank you for sharing your beautiful cape cod house with us. We loved the peace that the waterfront brought us. The bird sanctuary was pretty and interesting to watch the different birds. We loved everything about the house, beach and nearby areas. We took in seal excursion, mini golfing, and tried various seaside restaurants. Thank you so much for all your detail decorating and stocking house to make our stay just perfect. These guests were great, and extremely complimentary about the house during and after their stay as evidenced in their review. So I was confused by the 4 star rating. I inquired if something was wrong and they said it was a typing error on their part. They tried to change it, not allowed. They tried to write a second review, but Homeaway in its infinite wisdom would not allow that to happen either. C’est la vie! From the moment you walk in to this beautiful home you feel welcomed. Owners Brian and Gail are wonderful. All you need is your clothes and food. Every morning to wake up to the water was a gift. Book this lovely home for your vacation!! You will NOT be disappointed. Brian and Gail were helpful from the moment I booked, to the end of our stay. I had questions, and they were very quick to answer them. The home was clean and inviting upon our arrival. They had the table set for us, and left us a small gift with a welcome note. We needed nothing but clothes and food. The beach/ocean was great. We walked, swam and fished it daily. We enjoyed the top deck on the home every night, watching the lights from the ships which passed thru Hyannis harbor close by. We vacationed in September and the weather was perfect and the crowds were minimal, exactly what we were looking for. The Cape Cod bike trail was awesome. We rode different sections three times, as well as a 30 mile ride thru the surrounding neighborhoods. We also took the ferry to Nantucket Island. That was a fantastic trip and I highly recommend it. There is plenty to do in the area if you choose, but the home is lovely and comfortable and hard to leave. The outdoor shower was cozy and the beds were very comfortable. The few neighbors we talked to were as pleasant as Brian and Gail. You will NOT be disappointed if you stay at Upwind. Hiking, Biking, Golf, Fitness Center, Miniature Golf, Fishing out the front door or charter a boat, Wildlife Viewing, Shopping, Restaurants, Live Theater, Cinemas, Museums, Sightseeing, Swimming, Boating, Sailing, Waterskiing, Windsurfing, Shelling, Clamming, famous Christmas Tree Shops, visit Nantucket (rent a Jeep and drive the beach or rent a scooter for a cross island tour) or Martha's Vineyard (to see where all those famous people live). $250 security deposit required. 6 people maximum, which includes babies and children. This is strictly enforced. Parking for 3 cars maximum. Note: Owner lives in separate building on site which has privacy fence; entrance door is away from main house.